This post was originally published here on July 2, 2013. I’ve since updated the photographs and text. 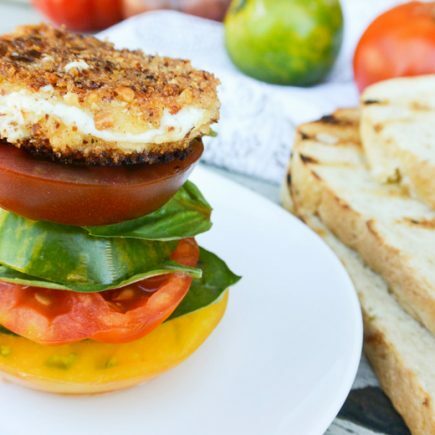 If you try out this recipe, I’d love to hear about it! Just give me a shout out on social media! If you’ve never roasted radishes before, I’m telling you it’s a life altering experience. And something that you should start doing on the regular. You see, radishes were never really a thing that I liked. Sure, I would put a few slices on a taco or in a salad. But eating a whole bowl of radishes? No way, no how. They were always too spicy for me. And frankly, I just thought the flavor of them was kind of odd (for lack of a better word). 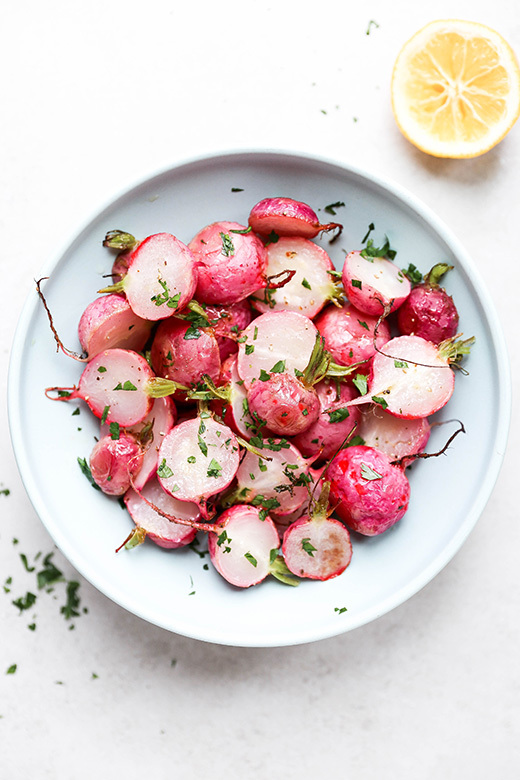 But several years ago, I started roasting radishes in the oven with a little olive oil, salt and black pepper (something born out of necessity, because I kept getting huge bunches of them in my CSA box and I was quickly running out of ways to them). And holy moly. Radishes actually tasted GOOD to me after that. And I even downright started craving them. So, if you’re generally feeling skeptical about radishes, I urge you to give these Roasted Radishes a whirl and see if you change your mind. They’re not as spicy as raw radishes. But they do still retain some of their earthy-ness. And while they lose a lot of their characteristic crunch, they’re not super soft either. I’d call them al dente. Tender, but with a firm bite. Oh and hello, they are super gorgeous, too. I just love their pink hue. And if you cut them in such a way that preserves a bit of the stem and root, then their presentation points go through the roof. They are a fantastic side dish for Spring. Or you can also use them to top risotto, salads, you name it! Trim and discard the greens from the radishes. Wash the radishes and cut them in half lengthwise. Then spread them out onto a large rimmed baking sheet and drizzle with olive oil. Sprinkle with the salt and pepper. Transfer to your pre-heated oven and roast for 15 minutes. 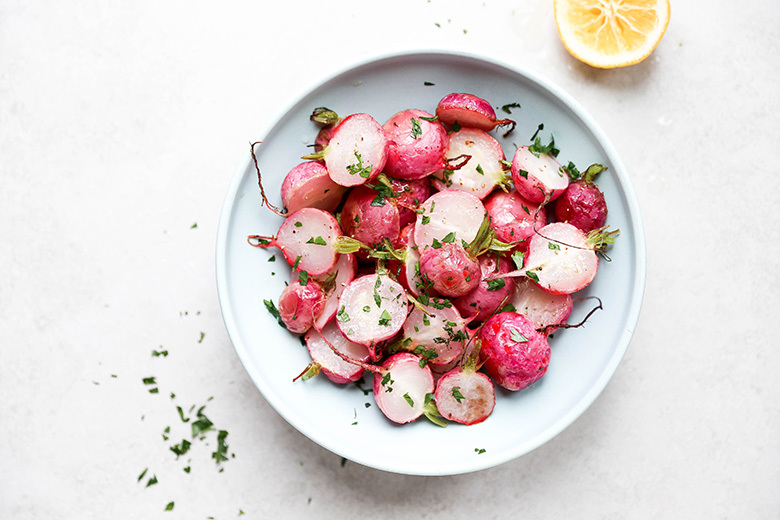 Using a pair of tongs, flip the radishes over, then continue roasting them for another 5-10 minutes, or until the radishes are tender and slightly browned. 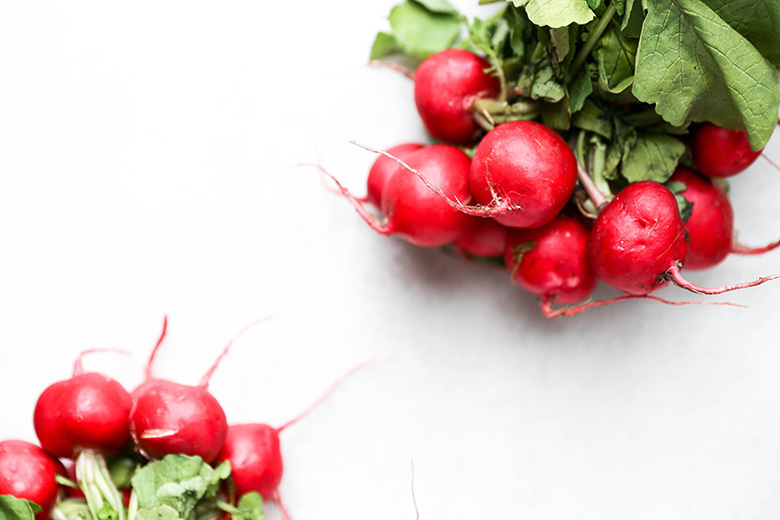 Remove the baking sheet from your oven and squeeze some fresh lemon juice over the radishes. Transfer to a serving dish and top with parsley. Serve immediately. Thanks, Cindy. So glad you like the site. And good to hear you are enjoying time with your daughter! I haven’t tried radish chips – sounds interesting. Every recipe that I’ve made that has included an ingredient from my CSA I’ve tagged with the search term “CSA”. So if you type “CSA” into the search box at the upper right, you’ll find all those recipes. It might be helpful for you with your CSA. Enjoy! Love the way those pinks pop off the blue plate! 😍I’m not crazy about radishes but find I really like them roasted. Thanks for sharing! Roasted is the way to go! Thanks for the kind words, Caitlin! Thanks, Jessie! Such a fun way to enjoy radishes! 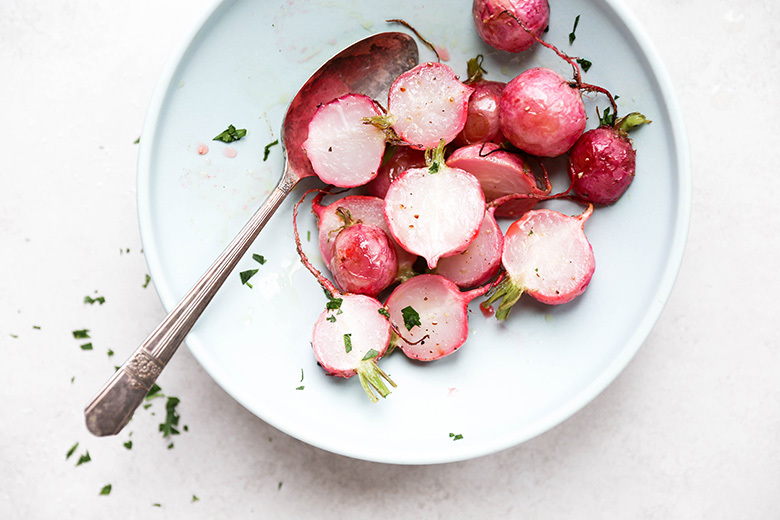 Al dente radishes…definitely need to try ’em out ASAP! A pretty plate of little pink flavor bombs… what a delicious way to welcome spring! I just warmed up to Raddish a few years ago both raw and roasted. I love them both – but I gotta say, roasting mellows that bite. I just had an idea of pouring some brown butter over the top 😮 !! Delicious work, Liz! Thank you for sharing! OMG yes to browned butter! Genius! These are SO SO SO gorgeous! Can’t wait to make them! 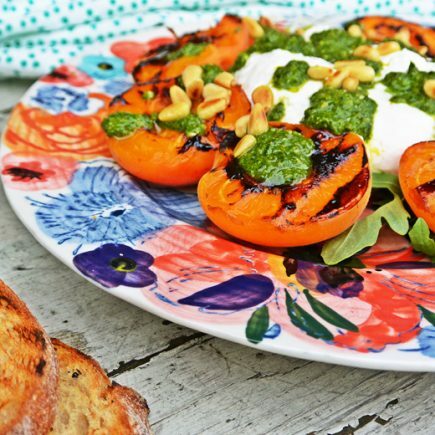 The best way to enjoy Spring radishes! So cool, I’ve never thought to roast radish and they still look awesome!! I love how the pink color kind of fades out a bit. So pretty! So I am a radish fan, but I’ve never roasted them before and want in on all of the above! They look amazing. 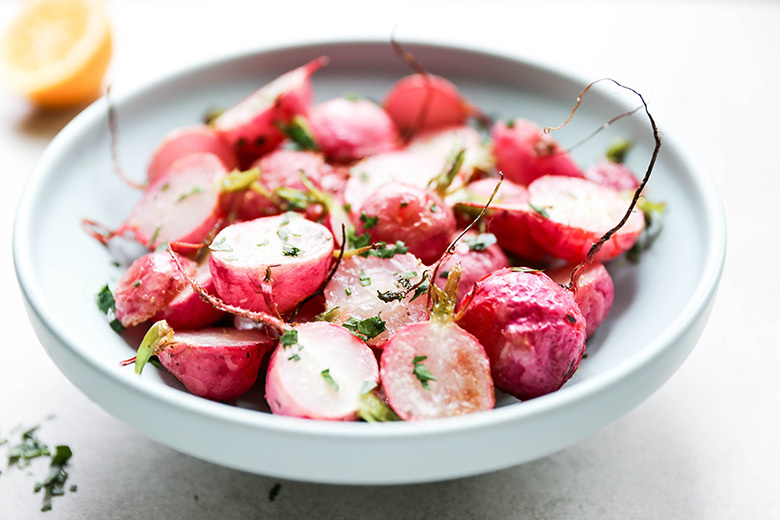 If you’re all ready a radish fan, then you’ll totally dig them roasted! Oh you and me both! I never liked radishes by themselves until I roasted them. Swooooooning!! Gorgeous! Ps I forgot to ask you, who designed your site? The new features? I’m loving it! Thanks, girl! Lindsay from Purr Designs. I just love it! Thanks, Maria! I love the color! Made these today as an alternate to roast spuds as I’m doing keto. Very yummy and not s bad substitute. Thanks for sharing. Glad you tried them, Jenna!